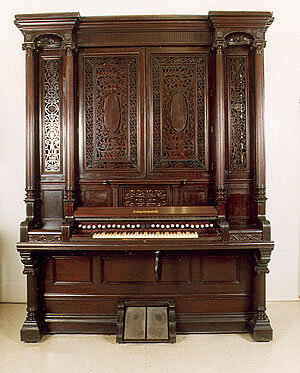 In 1904 Clemens bought this elaborate self-playing reed organ, with sixty rolls of music, for $2,600. Like a player piano, it was operated by a foot pump, but its twelve ranks of reeds produced a much more pleasing and varied tone. Clemens's secretary, Isabel Lyon, often played it for his entertainment in the evenings. It is now in the Mark Twain Museum in Hannibal, Missouri.